Is Trump descending into a sinkhole of his own digging or beginning to find his feet and rule as he pleases? He blindsides senior staff by impromptu decisions on trade, NK and Russia, losing an economic adviser along the way, firing the Secretary of State who wouldn’t toe his line and now about to dump McMaster, who wasn’t emollient enough. The only two grown-ups left in the room, Mattis and Kelly, both look terminally depressed moving ahead. 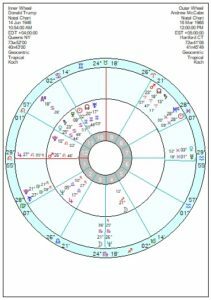 The Administration chart is moving into new territory with tr Uranus square the midheaven at the moment and then square the Sun from mid-May onwards – so there’ll be a few jolts and surprises, abrupt changes of direction ahead. And it also has tr Pluto square the Uranus now, on and off till late 2019 which tends to make for a rocky ride. Andrew McCabe, Deputy FBI Director, was fired just before his retirement, losing him thousands in pensions, in an act of petty spite. Which may yet blow back on Trump. McCabe, 18 March 1968, is a Sun in Pisces opposition Uranus Pluto in Virgo and trine Neptune (Moon) in Scorpio – used to a life of constant change and upheaval, idealistic, secretive. He’s also got Mars in Aries on the focal point of a Yod to Pluto Uranus sextile Neptune (Moon). Such a dynamic Mars would suit him for high-risk jobs – he was formerly in a SWAT team, fighting against organised crime and in counter-terrorism. He will be decisive, passionate, self-willed, inclined to let his anger run away with him. Once that Yod is activated, which usually happens through a crisis, he will need to stand on his own two feet and separate out from his past. Tr Uranus has been conjunct his Mars through 2017 and tr Pluto moves to square his Mars in 2019/2020 – so a longish period of where he will need to be self-sufficient, will be infuriated and blocked, but could cut through ultimately onto a new path. If mismanaged rash decisions can lead to self-defeat. 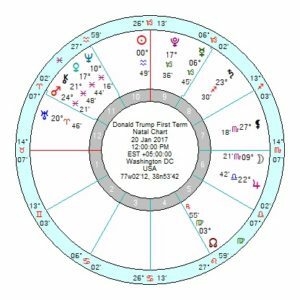 His Mars crashes into Trump’s Saturn Venus in Cancer, so he hits Trump where he feels vulnerable, denting his emotional self-esteem. McCabe’s Uranus Pluto squares Trump’s Sun and Moon, so he would be felt as a potential destabiliser; with McCabe’s Neptune square Trump’s Mars threatening to undermine his macho image. The relationship chart has a composite Mercury and Sun square Uranus, so on differing agendas; with Mercury opposition Neptune, trine Pluto, square Uranus – miscommunications, disagreements, evasions and outbursts. Plus a bleak composite Saturn square Pluto which may tie into the Moon. Not a match made in heaven. Their chemistry will be jangled, jolted and tense from this May onwards with tr Uranus in Taurus trine the composite Pluto and opposition Uranus; worsening through 2019 with tr Uranus conjunct Mercury; and more so in 2020 with Uranus conjunct the Sun. It could be an exceptionally bitter and messy argument since McCabe’s accentuated Mars looks under a great deal of pressure then. McCabe has a sticky three years ahead with disappointment, losses, dented enthusiasm and anger. Though he’ll start to bounce again come 2020/2021. 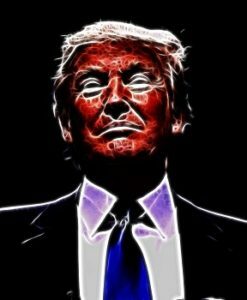 Trump does have his Solar Arc Uranus conjunct his Mars, exact in three months’ time, almost certainly triggering earlier, as well as at the time – that will lead to macho gestures, bravado, a surge of adrenaline to his brain, maybe a severe shock. There’ll be upsets this year with Ivanka and Jared, probably around June. The July Cancer Solar Eclipse will cause him some headaches since it is conjunct his Saturn Venus. An Eclipse on Saturn tends to bring heavier responsibilities and guilt/blame for past actions, sometimes also for the actions of others. An Eclipse conjunct Venus brings a first-rate emotional crisis with a sense that there’s no love coming in and thus the need to stand alone; also a dent in self-image. But I’ve always thought if he survives the Mars Uranus then 2019/2020 is when his real problems loom larger. In 2019 he has tr Pluto starting the two year opposition to his Saturn, which is a considerable uphill struggle and highly discouraging; plus a highly-strung tr Neptune square his 10th house Uranus; plus tr Pluto opposition two of his Mars midpoints in 2019/2020 which will make him feel caged and trapped. His Solar Return from June 2019 for a year has poleaxing Saturn Pluto opposition Mars which won’t be fun; as well as Sun square a panicky-failure Mars Neptune. His Term chart looks exceptionally depressed in late 2019 with tr Saturn conjunct Pluto, square Jupiter and Uranus, and that runs into 2020. Early 2020 the Uranus Pluto square on his Term chart comes exact by Solar Arc which will be the most unstable time, although that is just a stronger version of tr Pluto square Uranus which is around at the moment. By mid 2020 tr Uranus will be opposing the Term Scorpio Moon for more upsets. What to remember is that the Term chart does have a strong Jupiter which brings luck even when not deserved. The Democrats are giving McCabe a job, thus he will not lose his government pension after all. Maybe he won’t accept, because it would be politizing the situation. But I think this would have been a prime chance for a Republican to distinguish him or herself. However, they seem to be either too much into it or two stupid to do that. Is there a meaningful prediction in here somewhere? All is chaos already. Is there a time period in which he seems likely to go? I suspect leaving office would bring, in some respects, a massive sense of relief and would be spun by him as a kind of victory, since he can’t—in his own mind—ever lose. You didn’t correct McCabe’s birth date. According to wikipedia it was March 18th 1968. “What to remember is that the Term chart does have a strong Jupiter which brings luck even when not deserved.” I recall you posting something like that on George W. Bush’s term aspects w/r/t the Gulf War. Somehow, he came out of it all unscathed. Amazing. Trump will still surround himself with Yes-Men while NKorea tries to make reconciliation moves with Norway and other intermediates…all the same, Cadet Bone Spur will out-macho Little Rocket Man with launching guided muscles. Marjorie, Andrew McCabe was not born May 5 1968 as he was fired 2 days before his 50th birthday on March 18. Could you redo your calculations using the March 18 date please. Many thanks. Isn’t transiting Pluto (9th house)now squaring the Term chart Uranus (12th house)? Yes thanks. Also forgot this July Cancer Eclipse – have added both.